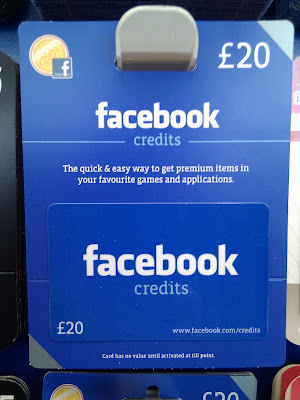 Facebook Credits are a virtual currency that can be used to buy virtual gifts inside a range of games and applications on the Facebook platform. The trading of virtual goods is turning into big business, the FT writing that last year the virtual goods industry was worth more than $1bn in the US last year and pre-pay gift cards should see this virtual economy continue to grow. Pre-paid Facebook Credits gift cards are now available in UK retailers Tesco and Game. 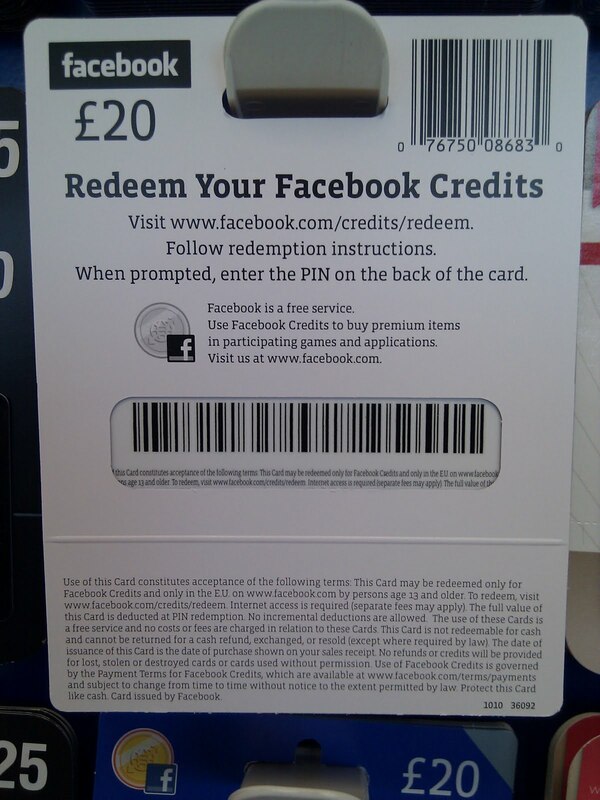 The Facebook Credits Gift Cards function in a similar way to iTunes cards (buy card, scratch off code, use on site) and widen the scope of virtual gifting by removing the need to have a bank card to participate. Whilst currently limited to virtual goods on Facebook there is an interesting comment in the Telegraph from Deborah Liu, manager of product marketing for Facebook Credits and games at Facebook. She 'told the Telegraph that although Credits could currently only be spent on Facebook.com itself, their reach could expand beyond the main site using Facebook Connect, which allows users to login to other sites with their Facebook ID.' There are intriguing possibilities in this idea - with it's huge reach, could Facebook Credits see Facebook (eventually) become a Paypal like banking / payment service.......?